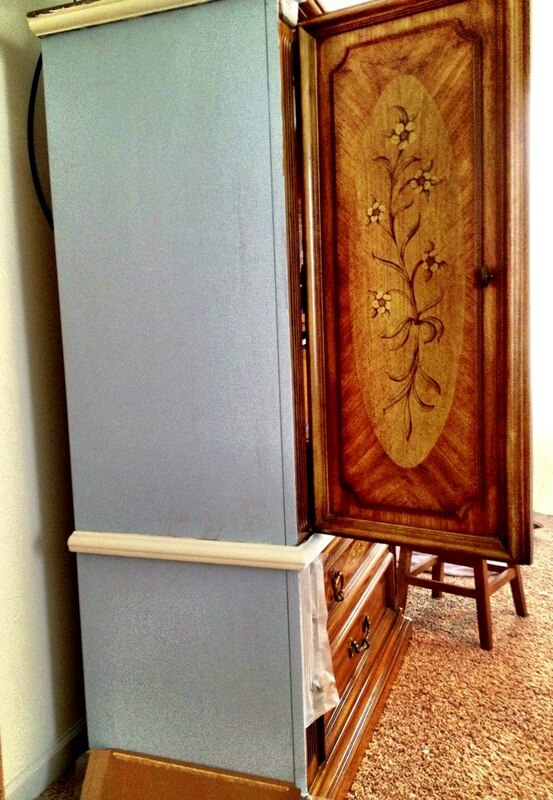 The first picture is for those of you who can't believe I painted over beautiful old wood. I know it looks warm and rich in the photo, but it did not feel like it to me. It was just drab. 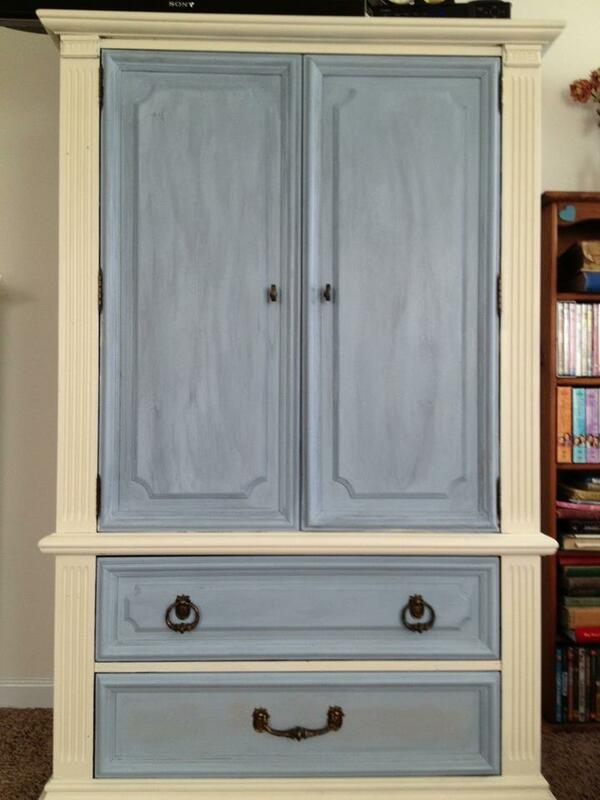 With Annie Sloan Chalk Paint you don't have to sand or prime! First side done. Use of flattened Pepsi boxes in lieu of drop cloths is standard at our house. Louis Blue loves to hang out with Old White. The first coat, which turned out to also be the final coat. The hinges are covered with Glad Press n' Seal. Then I tried different wax treatments. I used clear wax and added Old Violet to some, Paris Gray to some. In the end I decided to use the wax tinted with Old Violet on the whole thing. I still need to fix the bottom drawer to match. It is still wearing the Paris Gray wax treatment. I may still change the panels on the doors and top drawer. 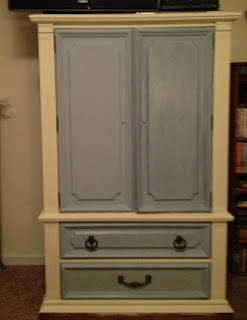 I am thinking about painting them back to plain blue and stenciling. Or doing a sheet music treatment with mod podge. What do you think? Would you have painted this? You are right... that is beautiful old wood! Definitely like the Old Violet better than the Paris Gray. Oh my, she is looking so great. I never even noticed the hardware on it before. Great job! I'm lovin' it. 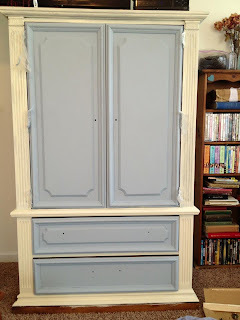 Beautiful DIY makeover...love the colors! 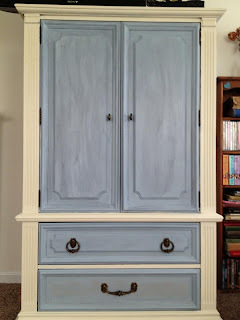 Hop over and enter my MMS milk paint giveaway. Lovely, lovely! And I'm with you - I'm terrified to paint over furniture! I'm taking baby steps to get to there. Yes, I definitely would have painted it. You made it absolutely lovely! Great job! Thank you for sharing this at Rustic Restorations Weekend! you motivate me. I am a newbie on painting over old furniture. I have recently gutted an old 60's Magnavox Astro Tuner console. We plan to finish it with newly build shelves for components and put it in the Family room with the TV setting on top. We want to paint/glaze it but we have never done such a thing. Any tips? Sgt Rich, I have two old television cabinets. One is gutted, one still has ALL the components in it. I have been waiting for the perfect inspiration to come to me with them. 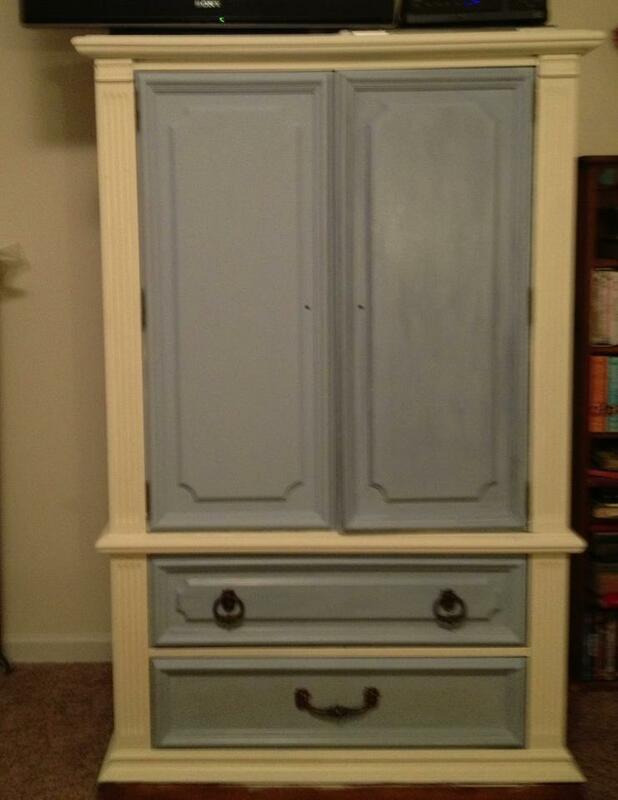 This isn't my first time painting old furniture, though. The thing with paint is if you don't like it - change it! Easy peasy. I haven't done any staining yet. I'm scared of it. Because I haven't done it. once I do something I'm fine. 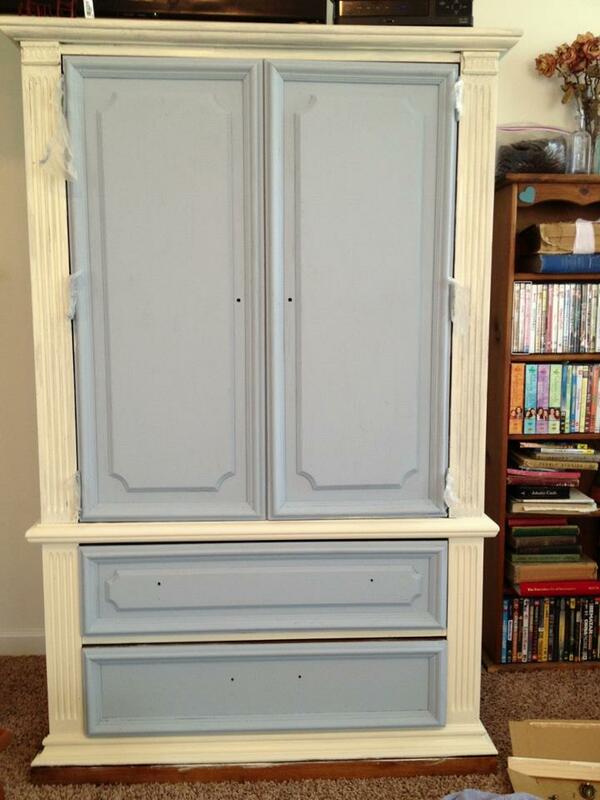 I really want to stain because I have seen a lot of pieces with stained tops and painted bodies and I really like it. Annie Sloan chalk paint is great because you don't have to sand or prime first, but... You do not get a factory smooth finish with it. And in some things you can see faint brush strokes. Milk paint is fun, too, but with that you have to be even more willing to go with the flow, or use a product in advance to make sure the paint doesn't flake off in spots. Miss Mustard Seed has a great line of products for you there. Plus, she's a lovely woman. 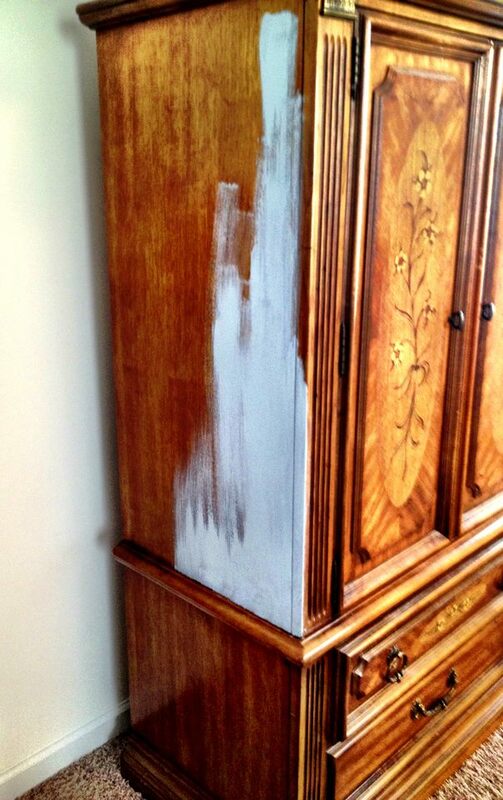 I've also used paint from Sherwin Williams and hardware stores to paint furniture, with great results. Those old consoles usually had pretty dark finishes, a lot of the time with red undertones, so if you use standard paint you definitely want to either sand it all off or use primer first. I know you're going to have it done in a few days and I'll be jealous, because one of mine is sitting by the stairs with a bunch of apothecary jars full of candy on it and the other is in the garage. can remember all of them. The stuff lasts forever. Was that any help at all? I love it! 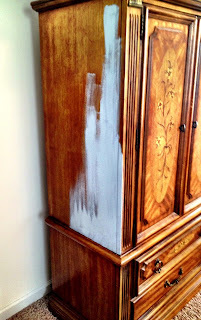 I have a question for you about staining and painting....maybe I'll ask you on my blog so as not to hijack your comments!!! Go ahead... that's what comments are for- right? Just great! Inspiring! So glad you shared it with me! I am getting excited for spring and the start of sale season! It was pretty before, but I love it painted! You can really see the details in the molding. Wow. It looks awesome. I have a few pieces that I just posted and was asking for ideas on my page. A fellow blogger directed me here. It souns easy, but I'm a little nervous... Can you check my page and give some suggestions?